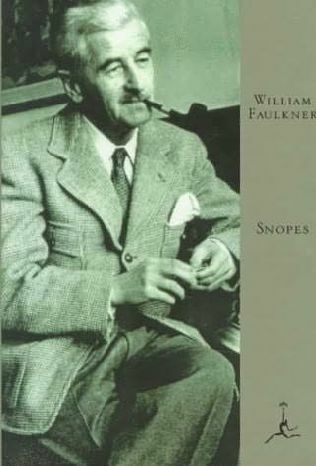 The Novel: Snopes is often referred to as a trilogy, but like The Lord of the Rings, it is really one book. Not quite the same, in that LOTR was written at one time and arbitrarily split for publishing reasons. Snopes was envisioned as one large work that was written (and published) over a large stretch of time. But letters from Faulkner indicate that he had the entire concept planned and plotted as far back as 1938. He even had realized that he had inconsistencies in the chronology before The Hamlet was even published. But still he worked at it. 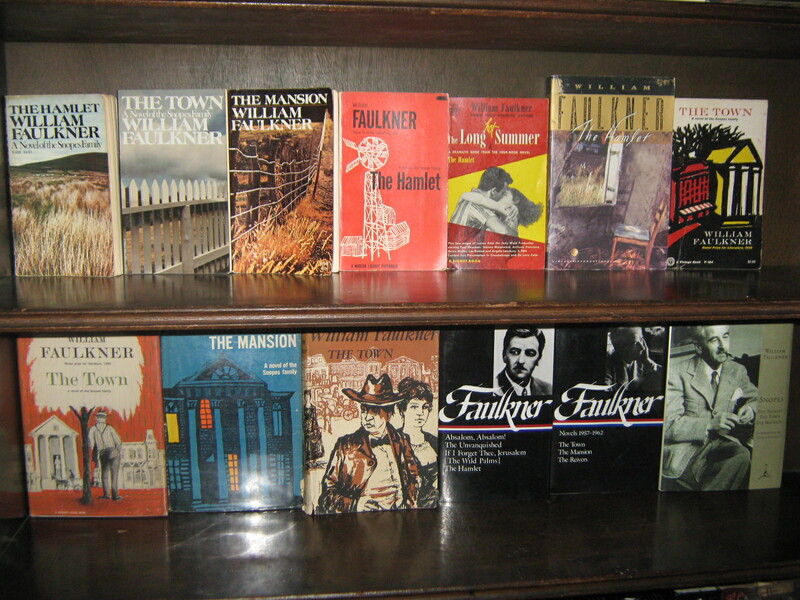 The first attempt at it was Father Abraham, begun in 1925 and the final volume, The Mansion, was published in 1959. It is the epic tale of one man, Flem Snopes, and his trail through Yoknapatawpha County. It is at once, his most epic undertaking and his funniest work. It begins with The Hamlet. Well, no, not really. It really begins with several short stories printed in the thirties that would eventually see print in revised form in The Hamlet. The best and most well known is “Barn Burning”, one of the classic short stories in American literature. That story is the introduction to Abner Snopes. In the background is his elder son Flem, the man who will be the focal point of the trilogy. Yoknapatawpha County is the setting for many of Faulkner’s novels, including his masterpieces: The Sound and the Fury, Absalom Absalom, As I Lay Dying, Light in August and Sanctuary, but this is the novel in which the county most vividly comes to life, where the county itself becomes, not just the setting, but a vital part of the story. The Hamlet is set in Frenchman’s Bend, the small little hamlet where the Snopes family come to settle, taking a share-cropping position with Will Varner. Varner is “the fountainhead if not of law at least of advice and suggestion to a countryside which would have repudiated the term constituency if they had ever heard it,” while his son, Jody, “emanated a quality of invincible and inviolable bachelordom as some people are said to breathe out the odor of sanctity or spirituality.” By the end of the first chapter, Flem has managed to bargain away his father’s tendency for burning barns into a position as clerk of Varner’s store. But by the end of the novel, going in each day in his white shirt and his black bow-tie, he has managed to secure Varner’s daughter, spirited her away for Texas long enough so that when they return their child doesn’t seem too old, earning the old Frenchman’s place as the dowry and pawned it off on several of the local men, including V.K. Ratliff, the local sewing machine agent, who should have known better. But before we get to that ending, we are introduced to Eula Varner: “Her entire appearance suggested some symbiology out of the old Dionysic times – honey in sunlight and bursting grapes, the writhen bleeding of the crushed fecundated vine beneath the hard rapacious trampling goat-hoof.” She is interminably lazy, but in her is a force of female sexuality that overwhelms others. Her teacher, Labove, stays years after he had arranged to leave because he can tear himself away from her: “It would now be himself importunate and prostrate before that face which, even though but fourteen years old, postulated a weary knowledge which he would never attain, a surfeit, a glut of all perverse experience.” He is driven by lust to attack her and when she resists, he surrenders, leaving her, the school and the town. But now she has reached sexual maturity and there are boys everywhere, they “swarmed like wasps about the ripe peach which he full damp mouth resembled.” Before too long she is pregnant, with her and her lover beating men away, him with a broken arm, and her using the horsewhip to defend them both. But he is not man enough for her and he flees town and Varner is suddenly left with a pregnant daughter and who should be standing there ready to be of service? Flem Snopes continues to move up in the world. In the time that they are gone, perhaps the most important event of Flem’s life happens: his cousin, Mink, kills a man named Jack Houston over a financial disagreement. Mink is convinced that Flem can keep him out of jail but Flem is staying away long enough for Eula to give birth to a little girl and once he hears about Mink, is determined to stay away long enough for Mink to be sent to Parchman, the nationally known prison in the Mississippi Delta. But Flem is off, this time to Jefferson, the county seat. He has wheedled half the ownership of a restaurant from Ratliff (“Anybody might have fooled Henry Armstid. But couldn’t nobody but Flem Snopes have fooled Ratliff.”) in exchange for the old Frenchman’s place (the same place that is the setting for most of the first part of Sanctuary), and he is taking along his wife and little baby girl. He leaves the hamlet and comes to the town. It would be 17 years before the next Snopes book would be finished. In the mean time, Faulkner had developed the town of Jefferson, specifically the character of Gavin Stevens. In the years between The Hamlet and The Town, Stevens had been developed as the primary character in Faulkner’s oeuvre, appearing in Go Down Moses, Intruder in the Dust, Knight’s Gambit and Requiem for a Nun. Gavin, along with Ratliff, becomes determined to stop the spread of Snopesism in Jefferson. So when we first saw Mrs Snopes walking in the Square giving off that terrible impression that in another second her flesh itself will burn her garments off, leaving not even a veil of ashes between her and the light of day, it seemed to us that we were watching Fate, a fate of which both she and Mayor de Spain were victims. By the end of the first chapter, the affair has enveloped the entire town through de Spain’s actions and because the brass ends up in the water tank itself and as Chick explains about the brassy taste, we begin to understand about that footprint: “Except that it not a monument; it was a footprint. A monument only says At least I got this far while a footprint says This is where I was when I moved again.” And Snopes is again on the move. The Town is the story of how Flem begins to move his way up and with every step he takes, he replaces himself with another Snopes, imported from all over the county. Soon he has moved beyond the restaurant and into the bank and even that doesn’t seem enough and eventually he ends up president of the bank by driving the mayor right out of town. In the midst of all of this is Gavin and his poor desperate obsession with Eula Varner Snopes, desperate to save her from the mayor, from Flem, from herself, from everything in the world. He loses a fight to de Spain, is mocked by his brother-in-law and is forced to sit on the sidelines and watch the legend of her infidelity grow while powerless to do nothing. Eventually he decides that he must save Linda from the Snopes world. He convinces her to leave for college but Flem holds her back (her father, she is told by Gavin and her mother, though no one believes this). When Flem is finally backed into a corner he reacts in such a way that only leads to pain and death, but eventually, for Linda, freedom. On the outskirts of all of this is the danger represented to Flem by poor, crazy Mink Snopes, who is moving ever closer to a parole. When Montgomery Ward Snopes is caught running a dirty-picture ring, Flem arranges to have him jailed for a liquor violation. This takes him out of federal prison and puts him in Parchman, where Flem arranges to have him help Mink to attempt to escape. The feeble attempt, with Mink forced to wear a dress, adds twenty years to his sentence, this keeping him away from Flem for yet another generation. This will prove to be the heart of The Mansion. The opening of the book is a reprise of Mink’s trial and the story of how he wound up in jail for 38 years. But he is finally released and his presence hangs over the rest of the book. Once again, through the eyes of Gavin and Ratliff and Chick we learn the rest of the story, of how Linda grows up and is married, how she is widowed and ends up deaf and eventually comes home to Jefferson. How she slowly learns the facts about her own life and how over-powering the hatred becomes of the man who drove her mother to the grave. We see that Flem has reached the pinnacle of Jefferson society, living in the large mansion, having out-swindled everybody (even poor bitter Jason Compson, the last surviving member of the family that was the heart of The Sound and the Fury). Everything leads to that final moment when Linda will help lead Mink out of the house which she has helped lead him too. 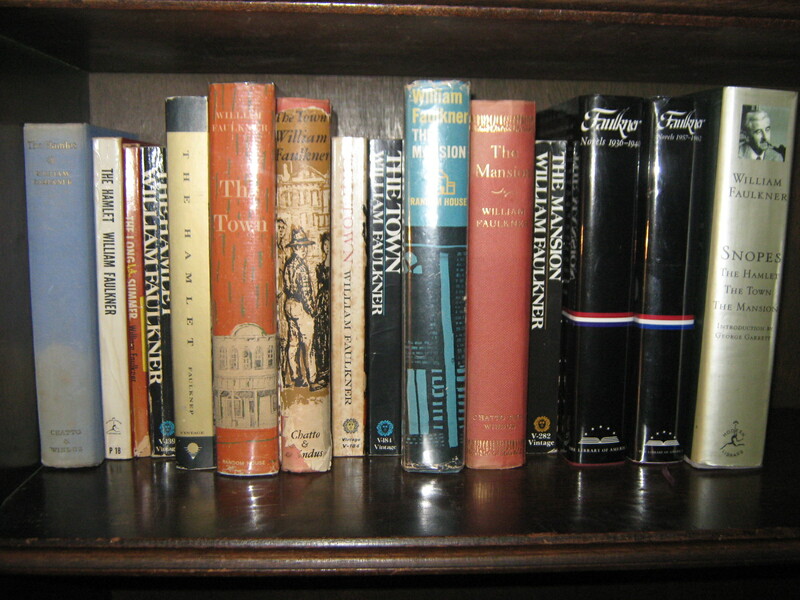 In over a thousand pages, Faulkner lets the details of the county come to life. We learn about 50 years in the heart of this country. The later two books reach major climaxes (both with a major death), but both follow up with a small little, rather humorous aside about other characters in the Snopes clan. There are so many of them that their stories can never be fully told. But in this work, one of the major achievements of American literature, Faulkner gives a complete portrait of a man, or as complete a portrait we can ever be granted for a man who is never allowed to give us his own side of the story. The Film: The Long Hot Summer isn’t so much an adaptation of The Hamlet as a movie about two Southern belles, a brash young man and an arrogant father. If you want to consider it an adaptation of the novel, it isn’t much of a film. It changes things drastically. Most of all, it takes the very notion of Flem Snopes as the main character, takes some of his actions and puts them in the man Ben Quick. But it also takes some of the other people in the novel and puts them in him as well. It creates an entirely new character in Clara Varner. In fact, the only two characters who are really brought whole from the novel to the screen are Will and Jody Varner. They are both perfectly played. Orson Welles and Anthony Franciosca seem to embody the characters, exactly as they were written by Faulkner. But what about the film as a film? Well, it’s a pretty good film. It’s always a danger when you have a real-life couple playing a couple on-screen (though they were just becoming a couple as filming was happening). But there’s no question that Paul Newman and Joanne Woodward have a sizzling chemistry onscreen. They belong together, both in this film, and in real life, where they were married for 50 years. Paul Newman embodies the kind of brash young man who would come into a town like this and take it over and Woodward is exactly the kind of woman he needs to cool him off a little. It’s an entertaining film. It’s not a great film, but it is well-cast, well-written, well-made and very watchable. And of course, there is Lee Remick. While Woodward’s Clara might have most of the actions of Eula from the book, there is no question that Remick embodies the craven sexuality that Eula is described as having throughout the book. She might only be half the character, but she is all the woman. And even though the actual burning of a barn never takes place in The Hamlet (instead that’s from “Barn Burning”, a short story that preceded the novel and the actions of which are only described in the book), it works fantastically in this film. It provides yet another spark. Jody might have actually set the fire, but its the sparks from Newman and Woodward that really make it ignite.